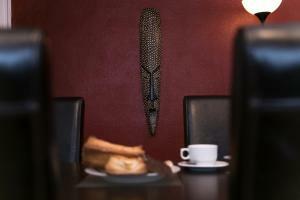 Featuring free Wi-Fi throughout, Alcam Gignas offers a self-catering apartment in the heart of the Gothic District. The lively area of La Rambla is a 7-minute walk from the property. Furnished with wood-beamed ceilings, stone walls and design furniture, this apartment has a TV with DVD player and a kitchenette with oven and microwave. The private bathroom comes with a bath or shower. The Boqueria Market is a 10-minute walk from Gignas Alcam, while Macba, the Museum of Contemprary Art, is 1.5 km away. Parc de la Ciutadella is a 15-minute walk from the property. Furnished with wood-beamed ceilings, stone walls and design furniture, this one-bedroom apartment with free Wi-Fi has a TV with DVD player and a kitchenette with oven and microwave. The private bathroom comes with a bath or shower. Rate: € 93.29 ... € 422.00; select dates below to get current rates.